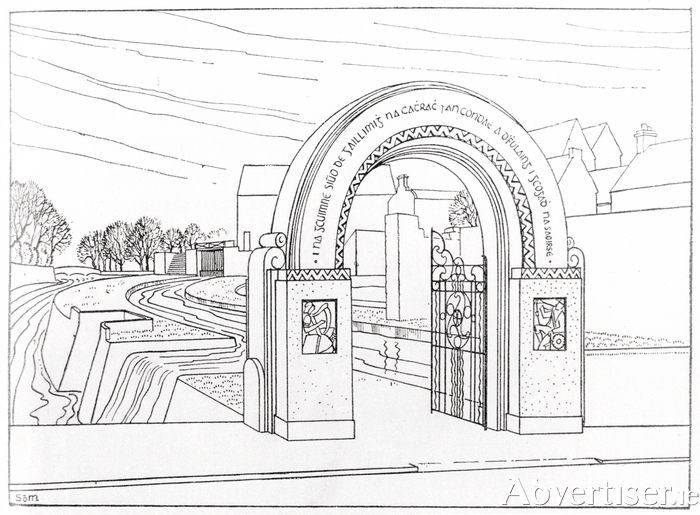 Design for the proposed 1916 Commemorative Arch. A motion proposing a memorial arch, first put forward in the 1930s and supported by Hollywood stars like John Wayne in the 1950s, commemorating the men and women who took part in the struggle for Irish independence between 1916 and 1923, has once again come before the Galway City Council. The proposal has been made by Independent city councillor Terry O'Flaherty, who wants the arch to be included as part of the programme of events for Galway city's commemoration of the Rising's centenary. The proposal is likely to be discussed at the council's September meeting, and Cllr O'Flaherty is seeking support for the idea among the other elected representatives. Galway was one of the few places outside Dublin, during the 1916 Rising, where significant activity took place. Most of the engagements, led by Liam Mellows and Joe Howley, took place in east Galway. The city on the other hand, lived up to its reputation as pro-union with public sentiment there being opposed to the rebellion. Significant change took place though in the Rising's aftermath. A heavy-handed response by the British, including the execution of the Proclamation's signatories as well as the imprisonment of large numbers in Frongoch prison camp in Wales, swung public opinion towards the Independence movement, leading to the 1919-21 War of Independence and the creation of the Irish Free State, and tragically the Irish Civil War of 1922-23. Cllr O'Flaherty's proposal for a memorial arch to be erected at the O’Brien’s Bridge entrance to the riverside walk is not new. It was originally proposed in the 1930s by Sean Turke from College Road, who, after some years in America, returned to Galway bringing money from Galway ex-pats keen to honour those who fought for Irish independence. Hollywood icon John Wayne contributed to the fundraising efforts. The actor, who was in Connemara shooting The Quiet Man, attended a gala concert and dance at Seapoint ballroom in Salthill in July 1951, along with other stars of the film, Maureen O’Hara, Barry Fitzgerald, and Victor McLaglen. More than £2,000 was raised but the project suffered setbacks and by the late 1960s Bord Fáilte announced it was reconsidering its financial support. Despite a number of attempts since, the project continued to failed to get off the ground. Cllr O’Flaherty is hoping her revival of the idea will fare better on this occasion. “It’s important that we get agreement on this as soon as possible so that funding can be set aside and a sculptor engaged to do the work," she said. "It would be a fitting way to remember those who fought for Irish freedom and I think it would also be a great aesthetic addition to the city centre."